Abstract: In this month’s MJ Studies Today column, Kerry Hennigan looks at Michael Jackson’s shout out to his audiences in his performances, short films and songs. She also considers his recording of the 1959 Isley Brothers’ song “Shout” which contains some powerful new lyrics. She queries Jackson’s intentions with his celebrated roar and suggests the song provides a clue as to what these might have been. Hennigan, Kerry. 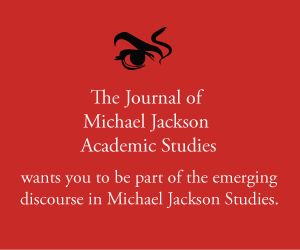 “MJ Studies Today XXXVII (14-01-2019).” The Journal of Michael Jackson Academic Studies 6, no. 2 (2019). http://michaeljacksonstudies.org/mj-studies-today-xxxvii/. While there is no known connection between Robert Graves’ story and Michael Jackson’s use of the vocal roar in his performances and short films (most notably in “Michael Jackson’s Ghosts”) it nevertheless gave me cause to think about Michael’s intentions with his signature shout-out to his audiences. What is he saying when he uses the mighty MJ roar? Like his recording of the song “Shout”, I think of Michael Jackson’s performance “shout” as the artist ensuring he has our attention, because he has a message that could prompt us to save the world from self-destruction. Though not Graves’ “terror shout” Michael Jackson’s roar is, indeed, a shout that could (metaphorically) “move mountains”, a roar that commands our attention. It was, perhaps, “fearful” or “terrible” in the context of being both a warning and a call to action; for us to come together in love to change the world for the better. That, I think, was Michael’s ultimate dream, and he wanted us to be fully “awake” to it. Jackson, Michael with Edward Riley, Claues Forbes, Roy Hamilton, Samuel Hoskins and Carmen Lampson “Shout”.